Nervously, she followed me back, past the treatment area and intensive care, looking around the door wide-eyed with fear, ready to bolt at the first loud noise. I coaxed her to the boarding area, and used soothing words as we neared the dog runs to stop her from shaking. You may be surprised to learn that I am talking about Mrs. Smith, not her dog! Our pets are part of the family, so naturally the thought of leaving them with someone else may leave some people with anxiety, fear, or guilt. I can tell you from experience, those feelings are far worse for our clients than for our patients. Boarding your pet at the Ridgewood Veterinary Hospital may help you to overcome those fears. When I took the leash from Mrs. Smith’s dog, he greeted me with a lick on the face, then bounded past her towards the door. He led the way to the boarding area, and waited for me to open the door to the run. He knows the routine and the kind of love and care he will receive. The first time I boarded my cat here, I planned to call every day, imagining her frightened, not eating, wondering why I had deserted her (I was a Mrs. Smith, even though I worked here). Then I spoke with an Animal Ward Attendant who said, “We love Lola. She does this cute thing where she jumps on my shoulders while I am cleaning her area, feeding her, and playing with her. By the way, she really loves to reach through the cage door and taps on everyone to pet her.” I breathed a sigh of relief. Although some part of me wanted her to miss me, I was blissful to see she was in good hands and she was happy. “Dr. Cerf did her exam and gave her vaccines, and said she is very healthy.” Another breath. When I picked her up, she wasn’t stressed at all. I let her out of the carrier at home, and she played with a toy. It was just another happy day for Lola. I will never board her anywhere else. Where do pets stay and do they go outside? They stay in runs, but dogs are exercised outside at least 4 times a day, more often if time allows or if the pet has special needs. All pets are always given the largest area available. They are all given lots of love and attention. What are the accommodations like? The entire hospital is appropriately climate controlled with heat and air conditioning, as well as radiant heating in half of the runs so that pets can choose to lay on the heated or cooled part. Younger puppies usually choose the cooler area, while older, arthritic pets may choose the warmer part. There is constant fresh air flowing through from outside and an air filtration system for allergic animals. Can I bring toys, a bed, etc.? You are welcome to do so, but pets will be issued a hammock bed or comfortable bedding. 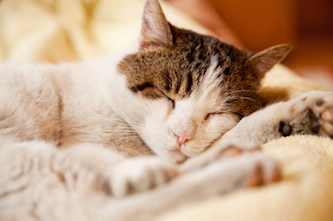 We recommend sleeping in an old t-shirt the night before so that your pet can be comforted by your scent. What do you feed them? It is always a good idea to keep as close as possible to your pet’s normal diet. If your pet is on a prescription diet or a diet we don’t carry, please bring it with you to avoid an upset stomach. We usually feed Eukanuba’s Low Residue food for dogs and cats if no food is brought from home. If you are boarding a bird or exotic pet, please bring their normal diet with you. Can you give medication to my pet? Yes, and if you are supplying it, please bring all medications in their original containers. We can also dispense it here if you prefer, and refill it if there isn’t enough for the entire stay. Can you board pets with medical conditions? We are able to accommodate pets with certain medical conditions, such as diabetes. Depending upon the condition, additional fees may be required. How much does it cost to board my pet? For the care, feeding, and cleaning of dogs, the fee is $49.98 per night plus tax; the fee for cats is $20.92 per night plus tax; other species range from $14-$35 per night plus tax. Normal fees apply for any other services. Why should I board my pet at the Ridgewood Veterinary Hospital? Aside from all the comforts above, you will have peace of mind that this is the next best thing to being home. Your pet will be with a caring team of veterinarians and medical support staff. Any irregularity is brought to the attention of a doctor immediately, and your pet will always receive the best care, love, and attention. How do I make a reservation? You can call or contact us online for a reservation. A boarding form will be sent to you or you can download it from our website. Go to Client Resources, then Client Forms. There is a Boarding Form for dogs, cats, and exotics (which includes birds). This form helps us to keep your pet’s routine as close to normal as possible. You can write your pet’s feeding and medication routine, special needs, likes and dislikes, and anything else you want us to know – even favorite phrases we will use to minimize stress. You can add on services, such as clipping nails, grooming, or anything you would like us do while your pet is here. Your pet must be in good health and current for the required vaccinations listed on the form. Enjoy your next vacation knowing that your pet is safe and sound, in caring hands. Your pet will look forward to the next vacation at the Ridgewood Veterinary Hospital!